It's pure bliss for plinking! 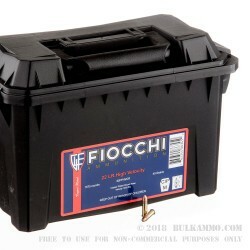 This bulk pack of 1575 rounds of .22 Long Rife 40 grain copper plated round nose offering by Fiocchi comes in its own plastic ammo can. What could be better than that?! That makes for a long and affordable range session. .22 LR is a great caliber to start new shooters off with. It is quiet, low recoil and can be shot from pistols and rifles. The low cost per round also makes it ideal for working on marksmanship fundamentals without the cost of a bigger caliber. The provided ammo can makes it easy to store and transport to the range as well. 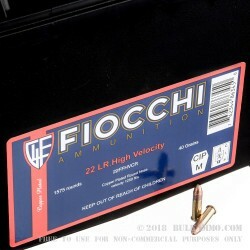 If you are looking for even more time on the range, we do have various quantities available in Fiocchi or other brands, although this product is very convenient, quality ammo, and enough to keep you shooting for quite a while! Fiocchi started in the year 1877 under the name “Giulio Fiocchi Enterprise” in Italy. With a long tradition of ammo manufacturing its easy to see why so many firearms owners turn to them for their ammunition needs. They have grown to one of the leading manufacturers in their industry, and continue to put out quality ammo at good prices. Q: How many rounds are in each of the "smaller boxes" contained in the ammo can? A: Good Morning! 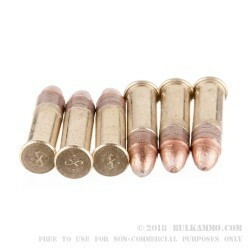 This ammunition is packaged in 3 - 25 round boxes which are then packaged in the ammo can. Q: is this just one big box of bullets or is it broken down into smaller boxes? A: Hello Jason, The 1575 rounds are packaged into smaller boxes contained within the ammo can. The rounds are not packaged loose in the can.